A world of possibilities at your fingertips. Use the app to contact your Mercedes-Benz Retailer. Before you bring your car to us for the fitting there are just two things you need to do. 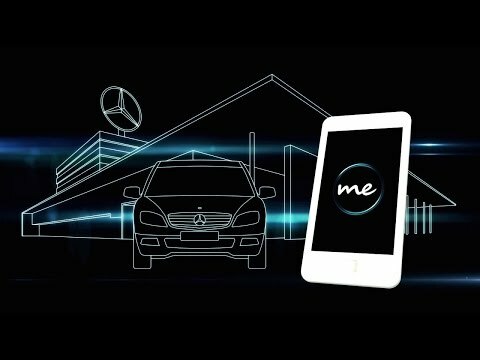 Download the Mercedes me Adapter app from the Apple Store or Google Play Store. We look forward to welcoming you for your free Adapter fitting. If you require any assistance with creating your account, please don't hesitate to contact us here. The National Mercedes me Adapter offer will commence 14/05/18 and is subject to change or end at any time. MBC UK reserves the right to end the campaign early subject to availability and performance. During the Campaign Period, all Mercedes-Benz Retailers will offer fitment of the Mercedes me Adapter at no cost to the customer. Customer requires eligible vehicle and smartphone to benefit from offer. Please complete a request form by clicking on the “Book your Fitting” or “Confirm Eligibility” icons. Only Adapter capable vehicles will be displayed in the list. If your vehicle model is not displayed in this list, please visit the Mercedes me connect website or contact your local Retailer. A maximum of one Adapter per vehicle is eligible for this Free of Charge offer. No cash alternative offer will be provided.